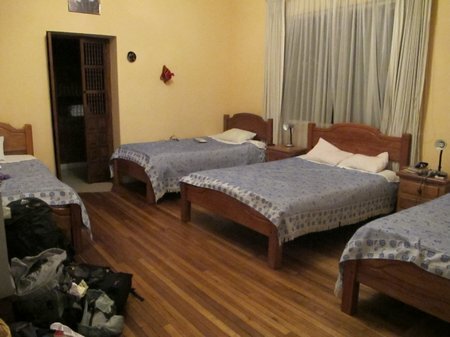 The Travellers Inn comes recommended in the Lonely Planet South America On A Shoestring guide. Before booking, we also checked out reviews of the property on TripAdvisor – which were all very positive. Our room, pictured above, had four double beds and an ensuite bathroom. It was perfect for a family of four with plenty of room for us to stretch out and it was big enough that our boys were not shocked into the realization that they will mostly be sharing a room with Mom and Dad for the next year The room and bathroom were furnished simply but were very clean and well-maintained. Our room was $50 per night. The location, in Quito’s New Town, is a short taxi-ride (10-15 minutes) from the airport. It’s an interesting 30-40 minute walk from here into the Old Town, although there are plenty of buses if you’re not feeling like the walk. The guidebook cautions that this neighborhood can be dangerous at night, but we found little evidence of this and we did walk to and from the hotel and restaurants at night, with our children. The hotel staff are friendly and helpful. There’s at least one person on staff who is pretty fluent in English. There’s guest wifi available in the rooms and in common areas – although we found the connection more reliable in the common areas. We planned a day in Quito after checking out of the hotel before catching our bus to Cotopaxi. There was no problem leaving our bags in a locked closet at the Traveller’s Inn for the day. 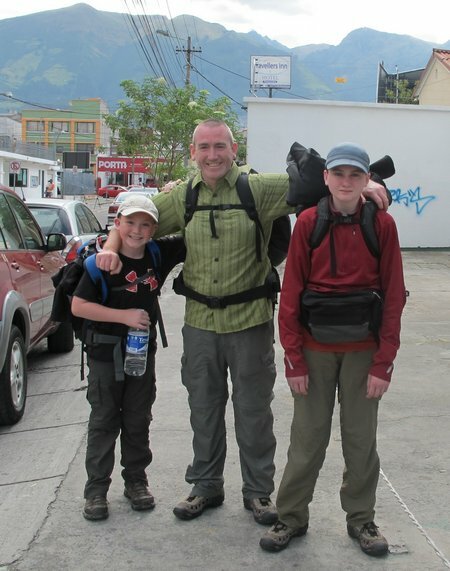 This entry was posted in Ecuador, International Escapades and tagged Accommodation, Ecuador, Hotel Review, Quito, Travellers Inn Quito on September 17, 2010 by wandermom. Glad you came to Quito! That’s where we live!